If your CRM solution is a hindrance and you are finding yourself working around your solution then it’s time to take action! Are you looking to move to Dynamics CRM? 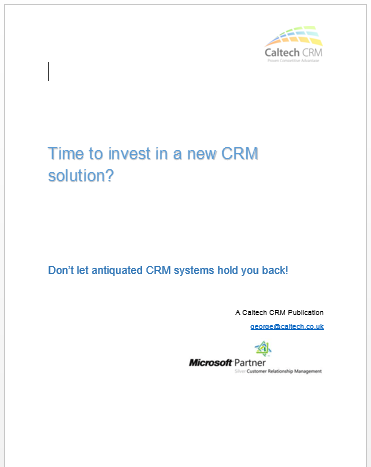 But is it time to replace your CRM and consider a move to Dynamics CRM? Can you fix some of the issues you are currently facing, or have you just fell out of love with your incumbent system? First things first, take a measured approach. Look at why the CRM you are using is failing. Is it in need of updating? Do your users need training? Is it matched to your processes? We had a prospect call in just this week asking about moving to Dynamics CRM from his ACT! Software. His data wasn’t agile enough and his processes were not married up to the solution. He realised that although his business had put a lot of time, money and effort into its current CRM, that his business was more complex now. We talked about what was going well in his current ACT! Solution, and we soon realised that although the data was up to date, the users were working around the system and double keying, and that he wanted more visibility around his business activities. A move to Dynamics CRM was a potential suggestion. Dynamics CRM held the keys for this prospect. The reason he had been drawn to Dynamics CRM was due to its flexibility and user-ability. The process bar and integration capability also helped to understand that Dynamics CRM will continue to grow with his business no matter how complex it became. Indeed, using Dynamics CRM can help to simplify the processes and really support his business users. The thing is, a move to Dynamics CRM will take time and effort. Working with Dynamics CRM partners, we can help you to implement it and get the most from the system, but in order to be ready for a move to Dynamics CRM you will need to ensure that your data is ready. That your users are on board. That you have the time to project manage this on behalf of your organisation. Do you want to find out more about a move to Dynamics CRM? Download our new white paper “2nd Generation CRM” and see more at Second Generation CRM. This entry was posted in Ebooks, Implementing CRM by Catherine. Bookmark the permalink.